10 Rules for Dealing with Police is a must for anyone. 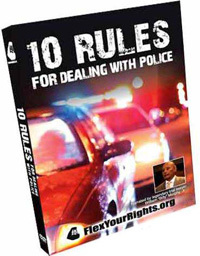 There are good and bad ways to deal with Police and this DVD will outline 10 Rules that anyone should follow. It is crazy how things in life can change instantly because of how you react. Take this as a training DVD for dealing with police encounters. Flex Your Rights’ first film, BUSTED has become a cult classic. Humor and helpful tips combine to make this video a must-see for freedom lovers everywhere. Created by Flex Your Rights and narrated by retired ACLU director Ira Glasser, BUSTED realistically depicts the pressure and confusion of common police encounters.